The following is adapted from an answer I gave to a post on a list. I've edited it to only include my one words and ideas and for clarity now that the context is removed, and to remove things that shouldn't be said publicly. I'm going to ramble a bit, touching on a large number of subjects. Just remember, I don't know anything, just like everyone else. ;-) So take it with a grain of salt and your mileage may vary. Back to my list above, the idea of Initiation as the ordeal of the Graal Knight leads me to the next discussion, Karma. First off, before I explain that, I'll say this, personally, I don't believe in Karma, the Western broken version or the Eastern version. 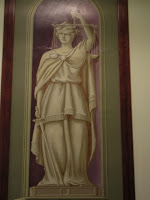 The Western version is really an attempt to take the modern Christian idea of justice verses grace, or more accurately, the Medieval ideas of Lady Justice and Lady Liberty which forms much of the modern Western mythology of Government (Lady Fate got lost somewhere, as un-Christian), and make it less "Christian" by rebaptising it as Karma. It is personified as that which spanks us if he do bad and rewards us when we do good, basically the way many modern people view the Christian god. Though even the Medieval concept was different from that. 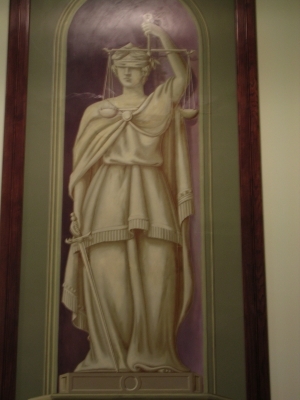 Lady Justice is blind. She weighs the deeds but has no personal stake in it, no personal connection to the individual or their actions. This is much closer to the Eastern (original) version of Karma, which is impersonal and very much a cause and effect, just on a level that's both physical (Yin) and spiritual (Yang). Remember, Yin and Yang in China are not two opposing forces but are two side of the same thing, connected, impossible to separate, and the Yin side can be further divided in Yin and Yang, and likewise the Yang side, a continuum, rather than duality. Same thing in Karma, which originated in the Indian Subcontinent. Science sees physical cause and effect. Karma includes those, but allows for spiritual and non-linear effects. But Karma is a principle in the world, not a god or spirit or entity like Western Karma tends to be seen. Karma is more like Fate, but doesn't really fully describe the way I see Fate. Which brings me back to the Graal. To me, this is the heart of witchcraft, of magic, of Feri (though it's from a different stream). "In fate, and the overcoming of fate is the true Graal, for from this inspiration comes, and death is defeated." How is death defeated? In surviving it. That's what initiation is. But, on to Fate. What is Fate? "The single name of all Gods". Elsewhere, Cochrane talks about cords and their use in witchcraft (which I'll get back to). There, he says, "They appear to have originated from the woven strands of Old Fate, the major deity of all true witches. "4 "The major deity of all true witches." This is important I think. I don't see Fate much in Feri writing or teaching, but She's there, both as the Star Goddess, and as the Three Mothers (the term used in Clan of Tubal Cain, a British witchcraft tradition), the Three Hooded Ones. I've only seen Feri references to the Hooded ones (often called the Cowled Ones in British traditions) in two Feri poems, so I won't dwell heavily on the Feri lore, but I will look at some other places. There's a Greek creation with that tells of Chronos and Ananke, serpentine with three heads each (Chronos', Time's, heads are obviously the past, the present, and the future; Ananke's are Fate, Destiny, and Necessity) curled around an egg. Their movement around each other broke open the egg and Eros was born, along with the mud that solidified into Gaia, and the water that became Oceanus. From Eros came Nyx and Erubus, Night and Darkness, who gave birth to Day and Light. Chronos and Ananke came from Chaos, but those three seem to always have been there. The movement of Chronos and Ananke's coils keep the heavens and earth turning, the stars and planets (including moon and sun) moving, the seasons changing, the tides turning, the lives of gods and men moving forward. Time and Fate are the two moving forces of the universe that even the gods are subject to. 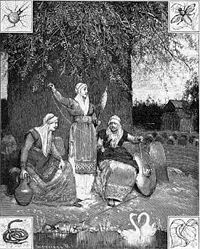 In Norse belief, we find the Norns (there are many norns, but there are three main ones), very similar to the Fates of Greece, three daughters of giant-kin who control the Threads of Wyrd, with power over gods and men. They appear many other places in Indo-European myth, from Ireland to India, and other places as well. Even in Jewish Kabbalah with the Three Mothers, Shin, Alpha, and Mem, Fire, Air, and Water. You even find them in Taoism if you know where to look. But where I was going with this is Wyrd. In my belief, Wyrd is the Threads of Fate that bind us together and determine each of our paths, and the paths of the universe. It is the Chinese web that has no weaver, it is Buddhist and Hindu Karma, it is Greek Fate, it is the Soul Spark of Kabbalah. Imagine a huge web, stretching forever in all directions in space and time. There are an infinite number of threads, an infinite number of paths, an infinite number of possibilities. But there are knots tied in this web, in these threads. These knots limit the options, direct where things can go, control the past and the future. Withing each of our Godselfs, there is a bundle of Threads at the middle. These are our Wyrd, our Fate. These Threads connect to the rest of the web. These Threads determine our options, our choices, our future. We received them from our (physical and spiritual) ancestors, and they came tied in knots to other threads, limiting us. But each action we take, each world spoken, each choice we make, binds new knots or looses old knots, limits or expands our options. Cause and effect. Getting back to "In fate, and the overcoming of fate is the true Graal, for from this inspiration comes, and death is defeated." Most people go through life on autopilot, essentially. They let Fate dictate to them their choices. They think they are deciding, but they're really just following the Threads, letting the existing knots determine the outcome. Eastern Enlightenment, Western Gnosis, is the realization of those Threads and our ability to change them. To step back from the web and look at it and consciously change it, to untie a knot here, tie a knot there, and change the course of history. To write your own Fate. This is truly what witchcraft is, the binding and loosing of the Threads of Fate. Once you move past letting Fate dictate, you enter the realms of Destiny and Necessity. Destiny is what Crowley was talking about when he talked about True Will. "Love is the Law, Love under Will. "5 It's what we can truly be if we take the reigns of our life instead of submitting them to Fate. As the Feri Maxim goes, "never submit your life force to another." Necessity is what Cochrane talks about when he says in his witch 'Law', "Do not do what you desire - do what is necessary. "6 Once we can see the web and know we can make the decisions, that we can create Change, we can see clearly what is necessary to accomplish what needs to be done. This is fully integrated, of course. It takes Fetch, Talker, and Godself to truly see the web, and see the Necessity. And, the mention of Love being the whole Law brings me to the next subject. Love and Law are of course both part of the Pearl Pentacle in Feri. But they can't exist without Knowledge, Wisdom, and Liberty/Power, either. To just act without thought means there is no Knowledge involved. No Point can be left out, or you are out of balance and can't act rightly. Going back to the discussion of Lady Liberty and Lady Justice, ultimately Dame Justice in Medieval thought is Law in the Pearl. Dame Liberty is Liberty/Power, of course. But Dame Wisdom, Sophia of the Greeks and Gnostics, got lost along the way. The White Goddess of Robert Graves fame has become an integral part of modern paganism and witchcraft (both trad craft and Wicca), but the Black Goddess, Sophia, the deeper mysteries, has been ignored by most. 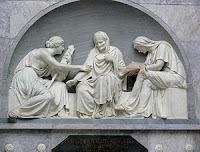 The White Goddess really stands as Fate and the Three Mothers, modernly seen as the Maiden, the Mother, and the Crone, though this misses a lot. But I'm on a tangent that I can't pull back, so I'll leave this one for now. Law, Dame Justice, as relating to Dharma, the Laws that define how the universe work, is not really separate from Fate. It is the workings of Chronos and Ananke, of Time and Fate/Destiny/Necessity that govern the things of the universe. None of the Points function in isolation, they are really one and the same, just as they are in the Iron Pentacle. Fate, Karma, is the movement, the Yin. Law, Dharma, is the stillness, Yang. Both come from the Tao but aren't the Tao, they are part of the Te of the Tao, the virtue, the properties if you will. The Tao and the One, are God Herself, the Star Goddess, the Uncreated, the Fountain of All, the Nagara. The Two of course, are Yin and Yang, the Divine Twins, the Tvennr, their constant Dance as Lovers and Fighters being the constant change in the world, Chaos, from which Chronos and Ananke proceed. The Three are the Three Mothers, the Three Cowled Ones that proceeded the gods, the Grimr. They are seen are the three heads of Chronos and the three heads of Ananke. They brought Order to the Chaos, though not stability, for they are always in movement. In Kabbalah, the Three Fathers come from the Three Mothers, though they are really the same. The Ten Thousand Things is the Chinese poetic description of all that is. Of these Ten Thousand Things, we find seven, the Guardians, the Watchers, the Seven Stars in the Sky, the Vordr. They are stillness and the foundation. The static forces that hold the universe together if you will. The ultimate teachers. If the Three Mothers are Fate and Karma, the Guardians are Law and Darma. To the next subject. As I said above, to act in a deliberate way, a way that creates Change rather than lets Fate determine the course, requires all parts of us ("I would know myself in all my parts"). There tends to be an emphasis in Feri to steer away from Talker, seeing Talker as bad, but this is mostly reactionary to a culture where Talker rules. Talker has a purpose and is necessary. Fetch cannot plan, as Fetch has no concept of Time. Fetch only wants what she wants and wants it now, has no ability to abstain or say no to desires. Talker is needed for these. But Talker isn't always right, either. There is a time to plan and a time to act without thought or planning. There is a time to abstain and a time to feed your desires. Both are necessary and shouldn't be ignored. And Godself understands the big picture of the universe, but has little ability to understand the little things that make up life. Godself without Fetch can't meet the needs of the body and souls. Godself without Talker can't make the little discussions that can get us to the ultimate Goal, the Graal. Hmmm, I said I'd come back to Cochrane's discussion on cords. Mrs. Basford has raised an interesting point about the real purpose of cords, harvest twine, string dolls, etc. They appear to have originated from the woven strands of Old Fate, the major deity of all true witches. They are, of course, the origin of such descriptive terms as "spellbinders." When worked up properly they should contain many different parts--herbs, feathers and impedimenta of the particular charm. They are generally referred to in the trade as "ladders," or in some cases as "garlands," and have much the same meaning as the three crosses. That is they can contain three blessings, three curses, or three wishes. 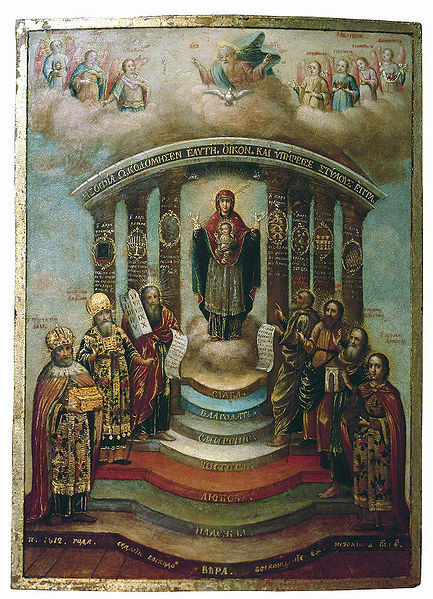 A witch also possesses a devotional ladder, by which she may climb to meditational heights, knotted to similar pattern as the Catholic rosary. There are basically two ways to do magic. You can bind or you can loose. You can curse or you can bless. Both ways can be used to do the same thing, if you're clever and cunning. In healing, you can either bless (improve the patient's ability to fight off the infection or to heal the damage) and loose (release the patient from the illness), or you can curse (kill the infection) and bind (hold back the infection or attacker to give room to heal). It is hard to bless and loose from darkness, and hard to heal and bind from light. But we both have both in us, as do all things, the Twins in the Great Dance, Shining Bright One and Shadowy Darkling. We can use our darkness, our impurities, our demons to heal, just as much as we can use our light, our purity, our innocence, our angels. While plants and woods like aspen or apple might be used in the loosing and blessing way, blackthorn, and the poisons I listed above, usually comes from the other side, killing the infection, removing the cause. The wording Cochrane uses is important here, I think. "They appear to have originated from the woven strands of Old Fate, the major deity of all true witches." The web of the Threads of Fate isn't just pathways, it is Herself. The web isn't just a metaphor, it is the Truth behind what we see, the Brahma behind Maya. When a witch takes objects and ties them into a cord, s/he is taking the physical "reality" and binding the Threads of Fate, the "stuff" of God Herself, around that reality, forcing a change. Basically the cords of binding, as used today, are worked upon with mistaken enthusiasm. Originally they were cords of Fate, woven and bound into a charm for a defined purpose. Sometimes shaped into a semblance of the object or person to be influenced, they were also hung on a gatepost or nailed near to the object or person, preferably in a public place, as an indication of intent. In an Italian spell, the ladder is actually placed in the bed of the person to be enchanted. A beautiful witch ladder, incidentally, was once found in a church belfry: presumably one of the Old Craft could not sleep late on Sunday mornings because of the racket of the bells! Anyway, I've rambled enough. Hopefully you find some kernels of grain among these tares.